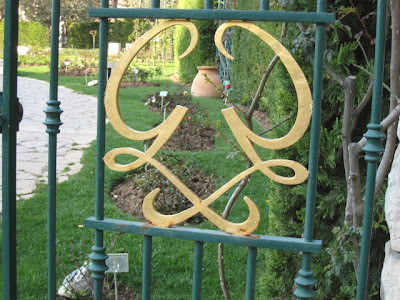 Here you see one of the gates to the Princess Grace Rose Garden in Fontvieille, the area of Monaco reclaimed from the sea. 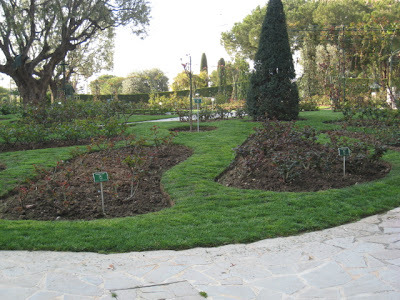 Dedicated in 1984 to the late Princess Grace of Monaco, the garden, currently dormant, holds 4000 rose bushes representing 180 different cultivars. It's a place of meditation and is open each day from sunrise to sunset. I'll try and get back in late Spring, early summer and photograph the garden for you. I'd love to see the roses in bloom. isabella wrote a wonderful dedication to Princess Grace. The same I would like be able to write me too. I'll wait for more photos and thank you. It would be very nice to visit this place. The scene must be fantastic and the smells. I would be very pleased to see this garden in June!